We manufacture, export and supply a range of RF Admittance Point Level Switch. RF Admittance Point Level Switch encompasses of a specially designed electronics and sensing probe using Driven Shield Coat Guard circuit and corresponding 3-Element Probe. The electro-mechanical combination of the Driven Shield technique in RF Admittance Point Level Switch makes the system immune to the material build-up on the probe and material bridging between the probe and the hopper wall. The RF Admittance Point Level Switch is widely applied in numerous products such as cement, sand, lime, flour, salt, food grains, milk powder, granular, chemical, etc. 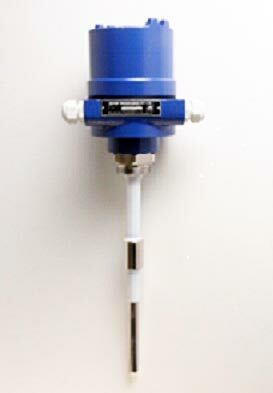 The JAYCEEADMITT Point Level Switch comprises of a specially designed electronics and sensing probe using DRIVEN SHIELD-COAT GUARD circuit and corresponding 3-Element Probe. The Electro-mechanical combination of the COAT GUARD technique makes the system immune to the material build-up on the probe and material bridging between the probe and the hopper wall. The unique feature of the system is that the measured signal does not flow to the hopper wall through the probe in the backward direction but flows only through the material. (actual material level) to the hopper wall.